National signing day arrived on Wednesday and a number of local athletes made decisions on their athletic futures. A pair of Rocky Mount Academy seniors faxed in their decisions, bringing the total number of college commitments to eight from the Eagles’ senior class, while two Tarboro football players committed to play in college. Elsewhere, a Southern Nash senior signed to play football. For Tarboro, defensive lineman Melik Ward signed to play football at N.C A&T and classmate and linemate Hunter Medford signed to play at Barton College. Rocky Mount Academy’s Barrett Eidson signed to play soccer at UNC Asheville, a Division I program. Also for the Eagles, Woodall Rose signed to play baseball at Methodist University, which plays in the USA South Conference with N.C. Wesleyan. Southern Nash’s Lamont Williams signed to play football at Chowan. Ward, who was recruited to play on the Aggies’ defensive line, was a four-year varsity starter for the Vikings who helped the team to win two state championships over the past two seasons. Ward had 69 tackles, five sacks, and a team-high 22 tackles for a loss this past season, anchoring a defense that allowed 62 points over 15 games. Shemar Thompson of Williams High School took a winding path to sign with North Carolina A&T on Wednesday. The running back who once was committed to East Carolina said he’s back on track after a mis-direction sequence that went awry during his senior season. “It was a tough time I had to get through,” Thompson said after receiving congratulations from numerous former teammates and coaches at the school. Thompson didn’t finish the 2018 season with the Bulldogs because of disciplinary reasons he chose not to discuss. “Stuff happened,” he said. But all those seemed forgotten after he signed paperwork and put on an N.C. A&T cap. HAVELOCK - It’s a common occurrence that the auditorium at Havelock High School gets use on National Signing Day each year. 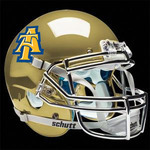 Hutchinson, a 6-foot, 205-pounder, is headed to Greensboro to suit up for the North Carolina A&T Aggies next season while Willett (5-9, 235) is head to the same city but a different program as he’ll be a Guilford Quaker. News on his knee came back positive as there were no tears and he said he’s on the mend. “It really means a lot, I’ve been waiting since middle school to have a chance to play college football,” Hutchinson said. “I had been getting some interest from other places and I had a visit to Western Kentucky set up but then they had a coaching change and A&T invited me up there and I just really loved it and felt at home,” he said. SNOW HILL | A.J. Dupree is looking to keep the N.C. A&T name strong in football. On Wednesday, the Greene Central senior signed his commitment letter to the FCS powerhouse with hopes of helping the Aggies continue its recent success. 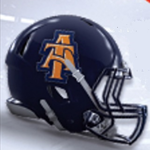 A&T has won three of the past four Celebration Bowls, four of the past five MEAC conference titles and an undefeated campaign in 2017 with a 12-0 record. Dupree, who plans to major in engineering, said the school was the right fit. We’ve never even ranked on any national rankings before and we landed 4 players on their top 300 list. BTW we are tied for 3rd most amongst HBCUS on this list with 4. We should’ve had 5 honestly but Prestige got “snubbed.” That would’ve had us tied with Alcorn State. And we could’ve had six but Western Carolina had one helluva recruit cycle.